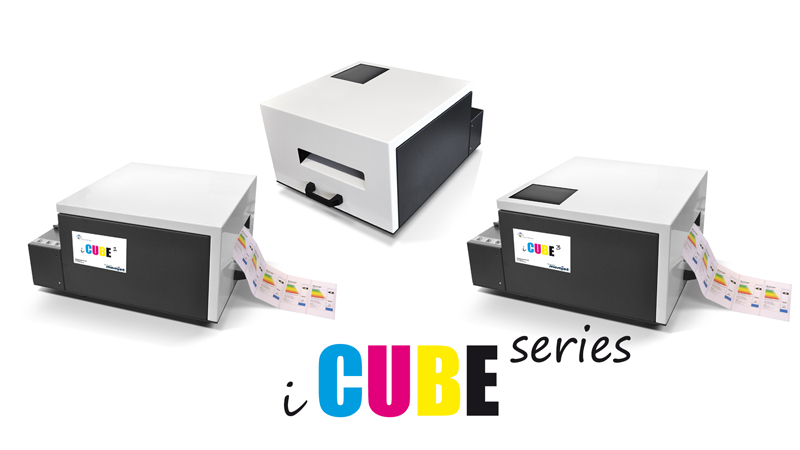 The iCube is a Memjet bulk tank high speed colour label printer with a purpose designed super smooth linked UNwinder and REwinder configured to print labels from large rolls of blank labels and rewind to finished printed rolls. The iCube replaces the large screen Speedstar 3000 and Vortex machines with a modern new design with a choice of no screen (iCube1) and medium 4.3 inch touch control screen (iCube2) and larger 7 inch touch control screen (iCube3). Based then on the previous success of the fixed head Memjet system with 5 x separate 250ml ink tanks c, y , m, k, k (two black), the iCube series is easy and very economical to use. With its roll to roll winders and linked base plate to align the winders with the printer the accuracy of alignment of print to pre-cut blank label registration is maintained even at high speeds making it ideal for those users that need to print labels to a roll either for passing then printed rolls to to an automated label applicator line or for printing finished rolls to sell to customers (print houses). The iCube handles labels up to 8 inches (203 mm) wide media so you can design and print a greater range of labels in narrow edge lead or wide edge lead format. The print speed is fast up to 150 mm (6 inches) or 12 inches (300 mm) per second so your labels are printed in moments. For each iCube model for example a popular size 4 x 3 inch (102 mm x 76 mm) full colour label can be printed in say a third of a second, or 10,800 per hour wow! * We configure the iCube with a set of inks and print head and a Microsoft Windows Driver to you can connect the printer to your existing PC or LAPTOP computer and favorite design software, or have a look at the free trial download of BarTender Professional here our most popular fully populated fully supported 'drag and drop' label layout software lets you easily build label designs using photos and text blocks, serial numbering, batch codes, barcodes, expiry dates, etc. 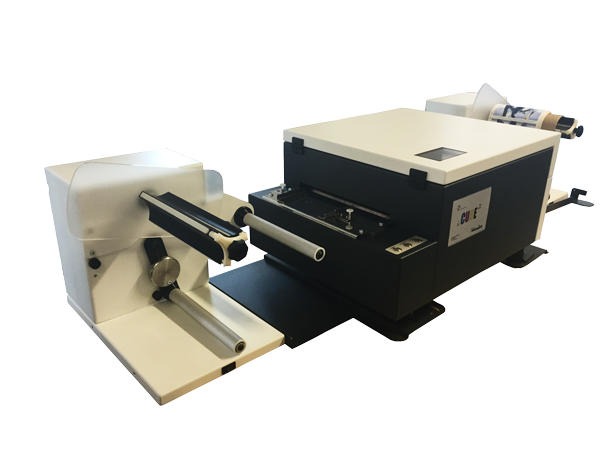 The iCube is best for roll to roll printing so is normally configured with its compatible roll winders. iCube3 (7 inch display) with stand-alone running capability from memory card has a larger display easier for the user to touch one of a group of small pictures of the labels needed to initiate the printing so no PC needs be connected and making it ideal for operating in a work area location. * theoretical maximum print speed in practice the printer will pause from time to time for automated head cleaning but will not reduce this capability much.